The little robot is back and this time he’s servicing and repairing cookers, washing machines, dishwashers and tumble dryers in the Black Country. 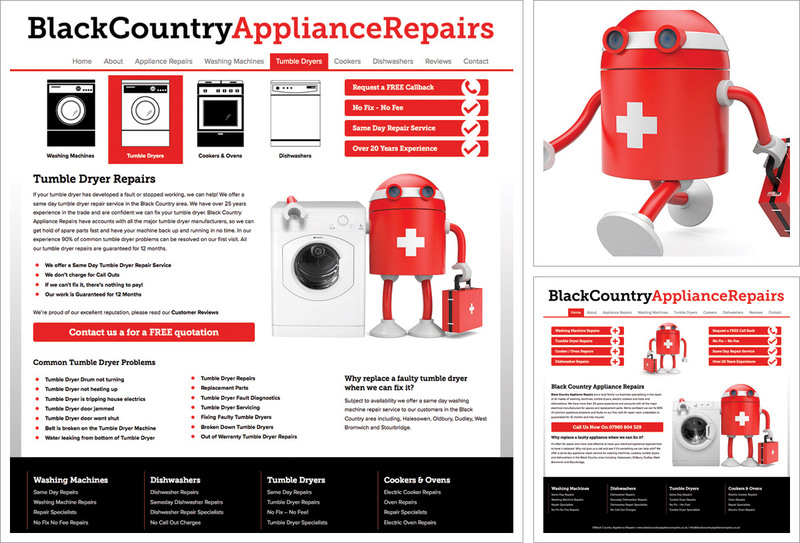 Black Country Appliance Repairs is a sister company to Worcestershire Appliance Repairs and Solihull Appliance Repairs operating in the Black Country area including Halesowen, Oldbury, Dudley, West Bromwich and Stourbridge. The website is professional yet friendly, on-message and it contains all of the information you need to have you reaching for the phone for a same day appliance repair. The website is striking and distinctive, easy to use, comprehensive and memorable. A mobile friendly/responsive website which gives the optimum navigation and viewing experience for website users from mobile phones, tablets, laptops and desktops. The website detects the type of device being used and adjusts and displays accordingly. All website content is relevant, unique and optimised for the black country region using keywords and phrases appropriate to the service offered. Individual services pages for dishwasher repairs, washing machine repairs, faulty tumble dryers and broken ovens all details the key service features e.g. same day service, no fix no fee, 12 months guarantee, no call out charges as well as a common fault symptoms, links to customer reviews and a clear call to action encouraging would-be appliance mourners to call in the medics, repair don’t replace!A mobile friendly/responsive website which gives the optimum navigation and viewing experience for website users from mobile phones, tablets, laptops and desktops. The website detects the type of device being used and adjusts and displays accordingly.